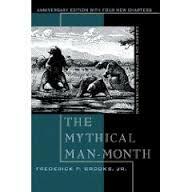 Man-month is a hypothetical unit of work representing the work done by one person in one month; Brooks' law says that the possibility of measuring useful work in man-months is a myth, and is hence the centerpiece of the book. Brooks' observations are based on his experiences at IBM while managing the development of OS/360. He had added more programmers to a project falling behind schedule, a decision that he would later conclude had, counter-intuitively, delayed the project even further. The tendency for managers to repeat such errors in project development led Brooks to quip that his book is called "The Bible of Software Engineering", because "everybody quotes it, some people read it, and a few people go by it". Therefore, assigning more programmers to a project running behind schedule will make it even later. This is because the time required for the new programmers to learn about the project and the increased communication overhead will consume an ever increasing quantity of the calendar time available. When n people have to communicate among themselves, as n increases, their output decreases and when it becomes negative the project is delayed further with every person added.